Magic Mike XXL is coming this summer and Channing Tatum and his boys are hitting the road. In this follow-up to the smash hit Magic Mike​, the gang goes across the country to spread the Magic. Warner Bros. has released a pair of posters and a set of stills featuring much of the cast of Magic Mike XXL, but of course, most of the spotlight lands on its star, Tatum! Click through and discover your first look at Magic Mike XXL. The cast is letting it all hang out in the latest poster for Magic Mike XXL. The boys are all here in the latest cast poster for Magic Mike XXL. 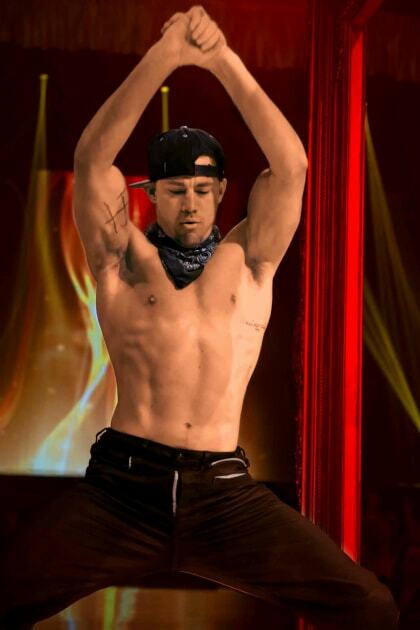 Channing Tatum busts a move in a still from Magic Mike XXL. The Channing Tatum Magic Mike XXL poster! 5. The Magic Gang Is Back! The gang from Magic Mike is back in Magic Mike XXL. Magic Mike XXL Photos: Channing Tatum Busts a Move!